Inspired by this TMP post: TMP link I thought why not give it a try in my new favorite scale? 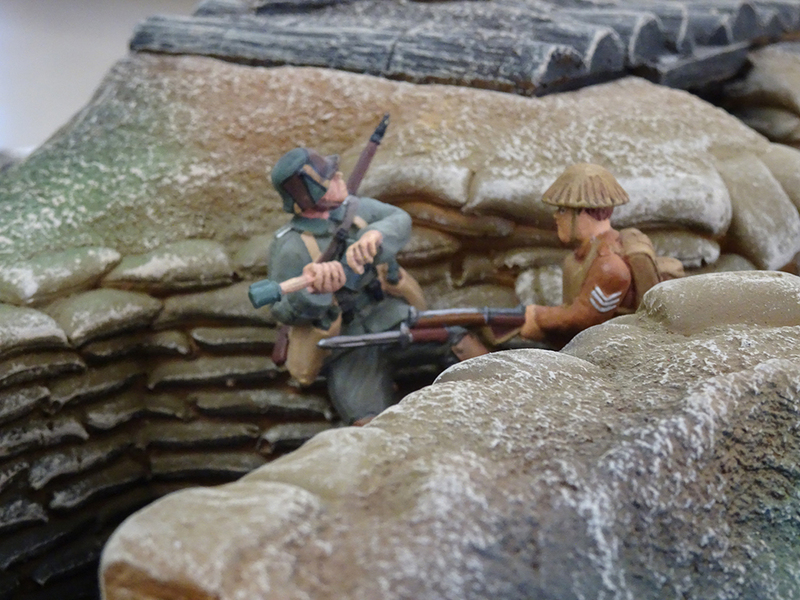 All you need are a handful of figures and trench terrain. You could even use a trench diagram on paper. 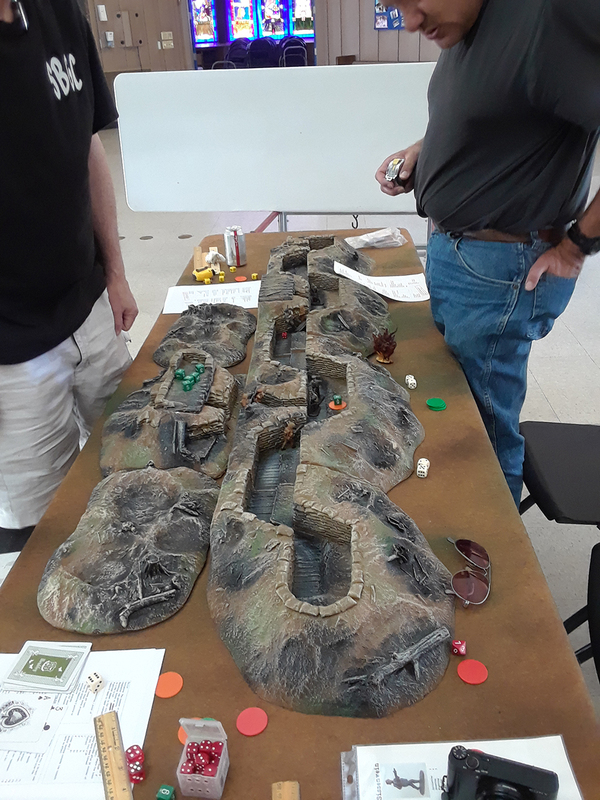 The rules are very simple, beer and pretzels, but they still offer some exciting moments of hand-to-hand combat and the ability for a figure to grab a tossed grenade and throw it back. We were able to play two games during our club meeting and each played very differently. 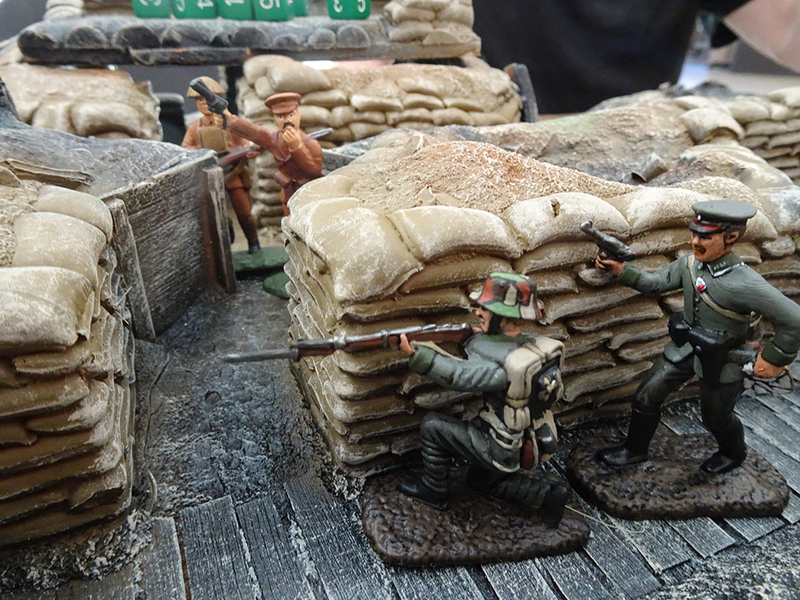 The miniatures are all plastic AIP aside from two metal German Stormtroops from Old Northwest Trading Company. That really is marvelous, Nick. 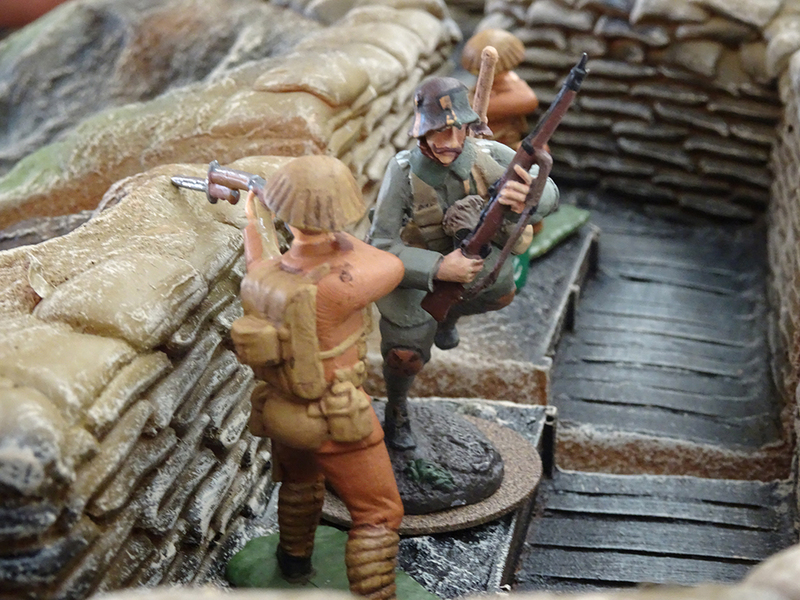 Love the terrain, the paint jobs (the German helmets especially) and of course the scale – but then we've shared our mutual love of 54s before! Right then, off to check on those scenics! Well, back from e-bay and several slugs of something bracing to calm my shaking hands. How have I missed that company? As someone who hates to prep and paint scenery they could be a Godsend. GREAT GAME, Nick! I REALLY like these very simple, yet elegant "rules"! Really just 2 or 3 pages. 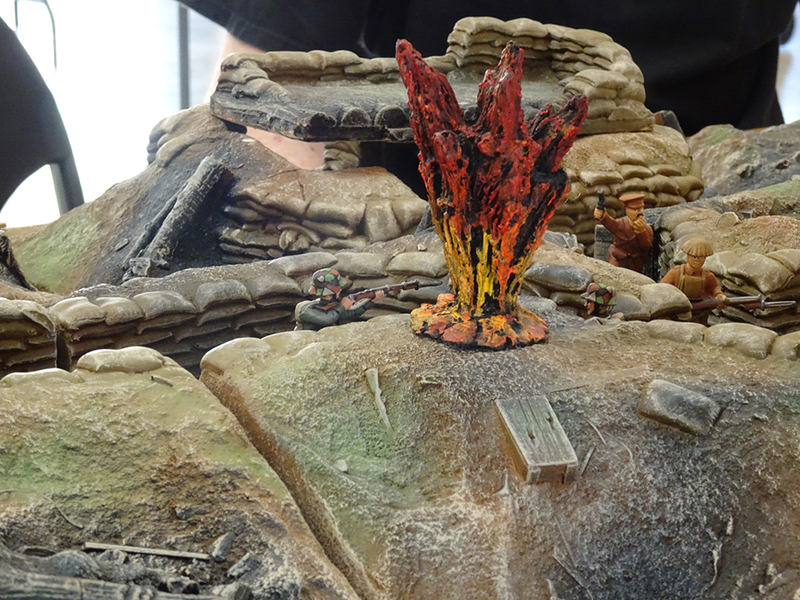 Your terrain is very cool also! Gone Fishing, I had a very kind TMPer take pics of the rules & send them to me. So I could send them to you if ya like. BUT there is ONE typo in them. You have 3 different "SKILL NUMBERS" Initiative, Shooting & Fighting. The Higher the better. In the (general) rules they state you need to roll your number or lower, which makes perfect sense. In the paragraph for shooting though, it states you need to roll your NUMBER OR HIGHER. Which absolutely contradicts EVERYTHING! So when you play them, just make sure when you shoot, like everything else, you hit if you roll your (sometimes modified) Number or LOWER! Send me your email & I'll get them to you asap. May be a day or so. I'm at work & I have a lot of work to do when I get home today also! And YES! These would work perfectly for Early War figs as well. No difference at all that I can see… well except for no sub-machineguns. I copied & pasted what you wrote & found them anyway, Nick! Did you catch the typo in the rules too? Caterman, we had to stop the game to discuss the shooting rules. I decided to just drop the automatic weapon modifier before we started the game, but I can see how it would work with the lower dice roll to hit. IIRC, after some discussion we talked ourselves into going with the high roll being better. I hate the inconsistency of having to roll high in some instance, but low in others. I am going to try out the game later this week using my favorite western shootout rules: Fistful of Lead for everything except the grenade rules, which I love. Some players thought that the activation by individual cards was more suited to a solo game and robbed them of their agency. In Fistful of Lead you are dealt as many cards as figures you run and then the cards are activated in a specific order, but you determine which figure gets to activate in which order so you can be a little more strategic. I'll keep the end of turn card and probably keep the joker for that extra move during the turn. Nick, I'm also a big fan of A Fistful of Lead. A great set of rules that can lead to some highly dramatic situations, though the solo possibilities with the WI set has its attractions also. If you can, please post pics and let us know how things go with the tweaked rules! Caterman, we forgot to use the officer giving orders to a subordinate within sight rule. 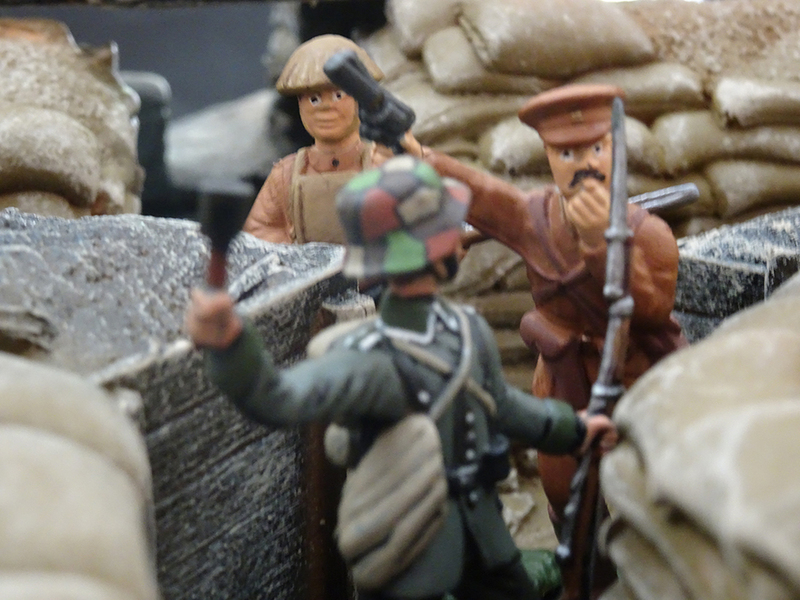 Actually, we started the game with five British on watch in the trench, including a sergeant, and five "asleep" in the bunker who took an action to activate once the alarm sounded. 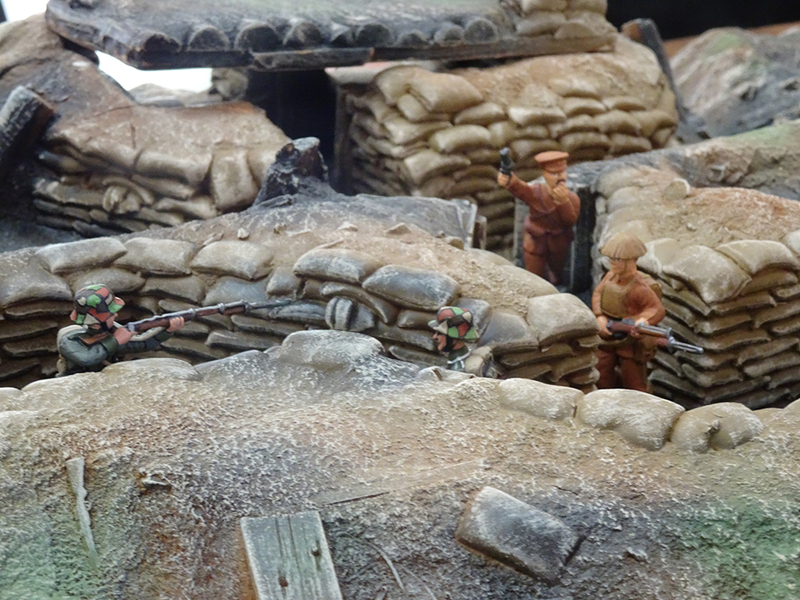 This seemed like a real disadvantage for the defenders in the beginning, but in both games, the British came back and grenaded the Germans out of the trench. Some other thoughts: I gave both sides the same number of grenades, but I spread the grenades out among the British, while the Germans had four designated Grenadiers. This gave the British a big advantage, even with only one or two grenades per soldier. Also, I gave each side one LMG and they were useless in the game due to the restriction of an LMG not being able to move and fire. I think next game I'll ditch the LMGs in favor more riflemen. The German Bergman SMG was highly effective, as it should be. Next time I'll give the Germans two if they're attacking. Have you watched the recent WW1 film Journey's End? 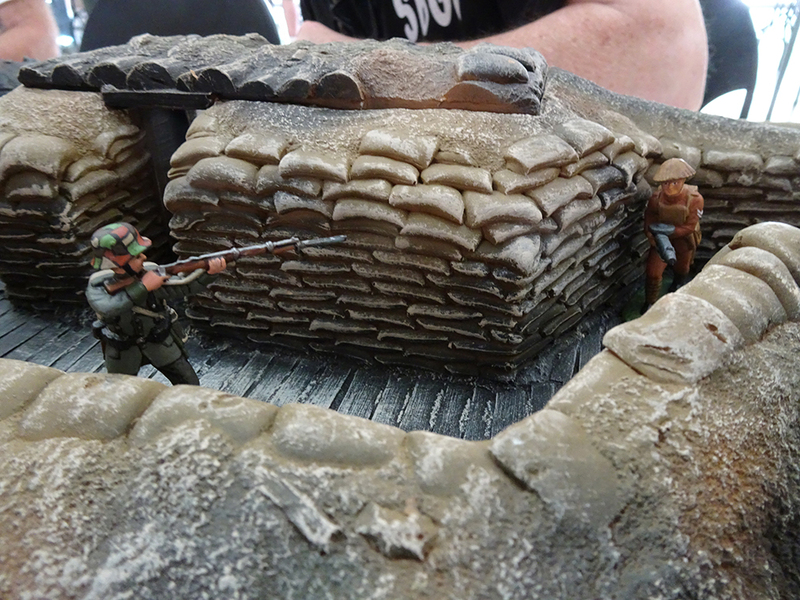 In that film the British execute a trench raid to take a prisoner. They send out two officers with revolvers, a sergeant and nine other ranks. They lose one officer and half their men, but they get the prisoner. I think might try that scenario next time. I definitely haven't given up on the rules as written, I am just curious to see how they compare to FfoL. Daryl, Sent in 3 emails! Enjoy! Nick, I had forgotten about that film! I need to see it! I can tell you from so much reading the attackers should have more grenades & the Brits used designated "bombers" as where the Germans issued more grenades to all their troops, especially raiders. So that should help. And yes, LMG's were not really used in raids. Way too heavy! I think with the rule changes, ie playing them w/o the typo, that should help! Very cool stuff here! Wow, I have just seen this (I am behind the curve) and this looks GREAT!!! Thank you for sharing. Brilliant! We love 54mm WW2, but sadly we think we will have to sell off our (Crossfire) collection as it looks like we will be moving to a smaller house.